Images from Andong – Hello Korea ! Heres’another teaser, but honestly, I am so wiped oufrom the filming and especially the talking with Holt, that I have decided to just give you the links to Flickr sets where I have grouped them together. I will, however, post from the collection occassionally if it relates to a post thematically. Do-san Seowon – This was the Confuscian Academy for elites. Very impressive. There was an English tourguide, but he was on vacation and I got stuck with a woman who wanted to tell me all about her sister in California. I learned more from reading the signs, which I took photos of because she kept wanting to drag me on to the next thing. We also visited the memorial mesum to Lee Juksa. He was a poet and anarchist whose dissident writing was NOT appreciated by the occupying Japanese, who jailed him 17 times. I guess his two brothers even died while in jail. He’s a national hero, and his descendents run the memorial museum. It’s a very classy museum, and there were quite a few people visiting. Hoejae’s (pronounced Hwehjae) Burial Mound – this was located about 100 meters from the residence of Sujoldang. There are two mounds, the lower less elborate one is his daughter’s. Rural Andong – these are images within walking distance of Sujoldang. 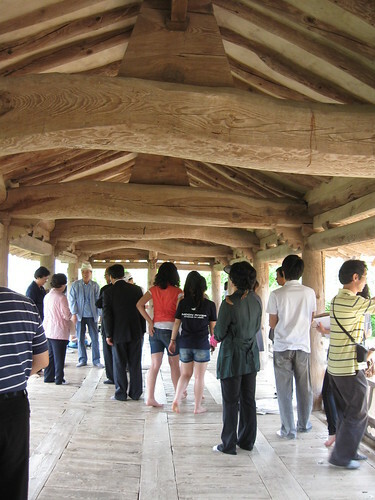 Sujoldang – This is where the philosopher Hoejae’s direct descendents live. The big farmhouse like building was always there, and the small collection of buildings (which are registered as a national treasure) were close to Do-San Seowon at one time, but were moved to this location after the damn was erected. One of the buildings photographed’s sole purpose is for ancestor worship, and inside is a reliquery for Hoejae. Nine stone’s mother & father in-law live in the house like all their ancestors before them. This year they must move to the big farmhouse, which has been remodeled to include some modern conveniences and will eventually become a guest house) while the government works on repairing and restoring the buildings that are considered a national treasure. A film crew was there the week after, and the buildings will be featured on a t.v. show this weekend. Yi-Hwang’s House – Another continuously occupied treasure, this large compound housed a famous neo-confusionist named Yi-Hwang, and also served as a school for select pupils. Nine stones father-in-law came and I think we got special treatment as a result. They gave us drinks and a copy of Yi-Hwang’s list of ways to live a proper life, written when he was ten years old. Bong Sung Temple – These are from a buddhist temple. The temples here are a lot less ornate and ostentatious as the ones in Thailand. They seem to be more in harmony with the natural surroundings and celebrate them. (for example, stacking the stones vs. some highly refined prayer) The monks seem more about private work than catering to the populace as in Thailand. This temple also had annexed to it two smaller groups of buildings, and one of them is pretty much perfect: in scale, harmony, relationships, materials, landscaping. My photos can’t capture how wonderful the spaces in this place were. I had to imagine what it was like without the dozen or so people always getting in my way. But even with their distraction, it was really serene. Just perfect. Byeoungsan Seowon – This is another Confuscian academy for elites. But twice as large. The grounds were quite large, actually. It was unique in its architecture in that it was much more essential, plain, and just naturally beautiful, and time and heavy use only accentuated its beauty. I guess it’s quite the mecca for architects who travel here to study it with a microscope, in the same over-academic way Greek temples are studied for the slight entasis of the columns, and the forcing of perspective, etc. 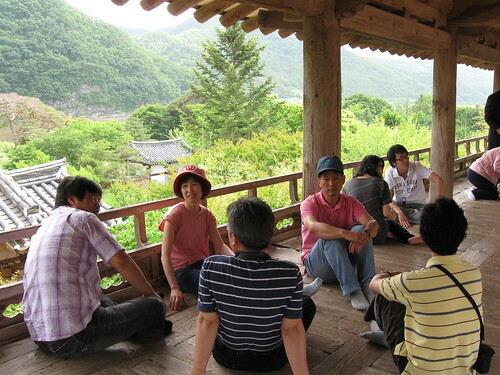 This Seowon has breathtaking views, sitting on the bluffs of a river and looking across at cliffs. Supposedly it was designed to be perfectly aligned with the valleys between all the mountains visible in the distance. And the main classroom, the pavillion where so many of these photographs are taken, seems to just float in the sky when you are sitting there. All during the trip, everyone worried where I was when I would lag behind trying to get good photos. (especially without tourists taking photos of each other) But eventually they realized I just wasn’t ever going to catch up. I think Korea’s timezone is very close to Taiwan’s. Love the architectural detail in your photos. I’ve been interested in Korean building and woodworking for some time, but there is not very much available in the way of books. You might want to review not only the close-up details, but also the over-all building shots then. 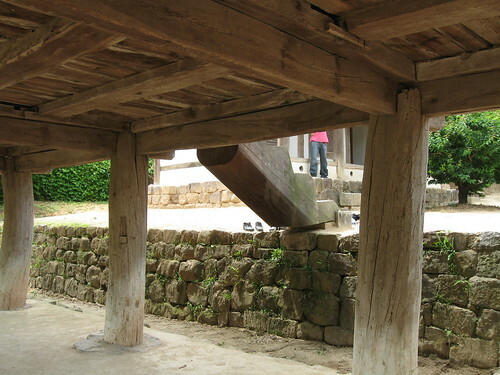 Each of the Bong Song temple buildings use an entirely different structural system, and the Byeoungsan Seowon is totally unique. The red building in the Bong Song temple is Korea’s oldest standing wood building, yet it seems more sophisticated than the larger newer building next to it. I noticed the hanoaks also use a double roof, which adds to their heaviness and insulating properties (common and sensible in cold climates) I assumed their walls (which are incredibly thin – 2 1/2 to 3 inches is all – and which I’ve been told is why nobody wants to live in hanoaks anymore) are not made of wattle and daub like I’d assumed, but seem instead to be made of clay/mud/straw infill. They are incredibly straight and smooth, so must have been assembled as mud bricks and smoothed over. As for the carpentry, it is very rough-hewn, which I really like a lot. It seems much less intentional than the wabi-sabi aesthetic of the Japanese. (hmm, I wonder if that influenced Japanese architecture at all?) And of course, all the joinery in those old buildings is without nails. I don’t know when nails became common, but should find out. I know I replied to your other posts, Ed, but don’t know where they went! Must have been one of those many times where I fell asleep with my laptop running and the battery died…I remember it took a lot of thought, so will have to revisit when I know I have some time. It would be interesting to understand the relationship between Korean and Japanese woodworking. I have always considered the Japanese the best woodworkers in the World, and use Japanese tools when I can. When we get to Korea, I plan on giving myself some time to wander off and study how things are built there. From what I can see, it is quite beautiful. Well, when you get here you will see how much masonry is everywhere. There is a special name for buildings made of wood, but like everything vocabulary I lose it if I can’t write it down immediately. I asked someone about the difference between Korean and Japanese architecture, and it seems that the Japanese temples and schools, etc. are much larger. Japanese farm houses and Korean farm houses might share some similarities, but Korean homes always had the ondol heating under the flors. I think Japanese urban ones often used plank construction. I love Japanese hand tools and from what I remember of Japanese joinery, the Korean work I’ve seen is much more basic. But I really like that. The Japanese teahouse and Wabi Sabi were intentional aesthetics contrived by elites who pined for simpler things – think Marie Antoinette dressing as a shepherdess. Korean buildings seem like the real rustic deal. It’s quite amazing to spend the night in a 400 year old building and visit a wooden temple that is over 700 years old. The weird thing is, they don’t seem that worse for wear and have been continuously occupied. It’s weird because our western buildings look like hell after 50 to 100 years. I need to get to Japan while I’m here so I can back up the theories from fractured memory I’m putting forward here.